I am a big fan of the Hydraluron range from Indeed Labs, I have really noticed a difference in my skin since using their serum and the matching moisturiser is lovely. 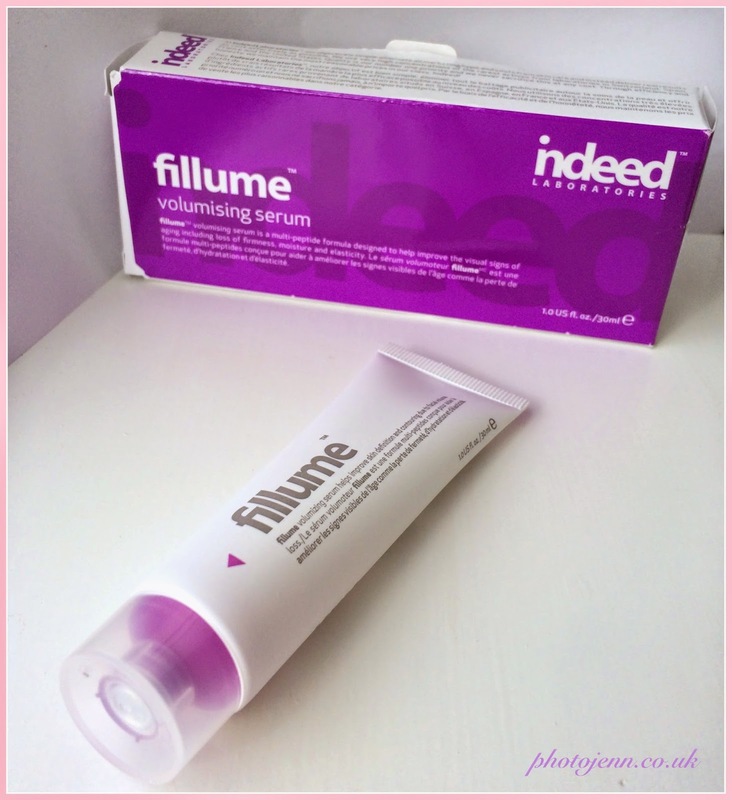 Indeed labs have released a new range in a very fetching purple packaging, the Fillume Volumising Serum. This serum will be taking over from my beloved Hydraluron for a while. It's designed to help improve the visual signs of aging including loss of firmness, moisture and elasticity. As I approach my 30's this is something I have to think about. Crows feet are starting to creep in (too much laughing) and I've always had issues with my very linked forehead (too much... looking up?) I don't smoke so I don't have to worry about the affects that could have, and I don't 'think' my skin is sagging just yet - but this serum is here to help with any of these problems. It claims to plump the skin in the areas it's lacking volume. Over time skin loses its density due to loss of collagen, elastin and hyaluronic acid. The skin will appear thinner and less firm, there's no fighting it - or is there? Incorporating the latest scientific innovations, fillume volumising serum is a unique formula of 5 clinically proven peptides designed to work on the skin’s matrix, helping to improve the appearance of skin aging. and improve the tone and texture of skin. You only need a pea sized amount before your moisturiser so I know it will last a long time just like my Hydraluron does. I'm going to be giving this a full test for a few weeks alongside the Fillume moisturiser and see how it is on my skin. I'll be updating you with my progress so keep posted! Do you have a favourite Indeed Labs product? Sounds like a very great product, haven't heard about it before though! We can never start too early!! At least there's products like this to help us out. I'll keep you updated on how I get on!